The Jamaica Transfer Station is located at 141 Castle Hill Rd. Jamaica, VT and is available to all Jamaica residents. Our Transfer Station Attendant is Dan Miller. Permits are required and available at the town offices. Permits expire Sept 30th – new stickers are available around August each year. *Jamaica bags must be used for all household trash (non-recycling). 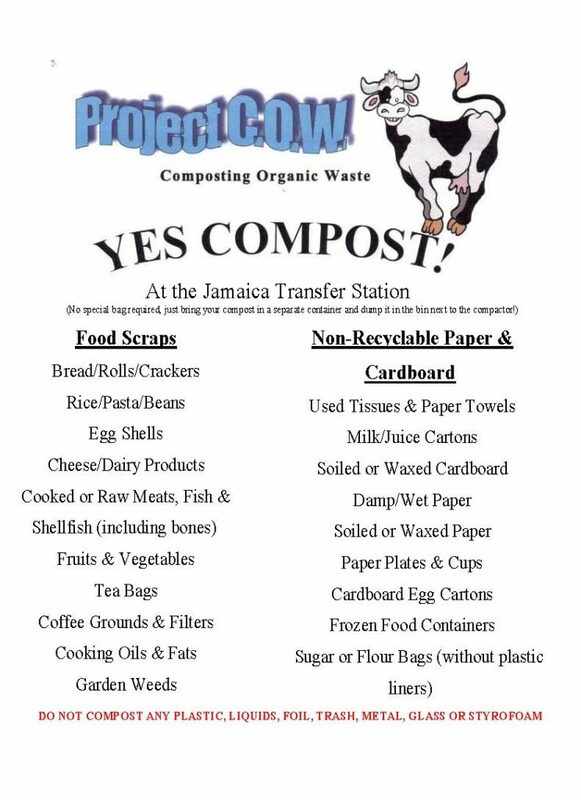 Bags are available to purchase at the Jamaica Town Office, D&Ks Jamaica Grocery, and the Rawsonville Market. Green bags (15 gal) $2.00 each, $20.00 for a roll of 10. Yellow bags (33 gal) $3.00 each, $30.00 for a roll of 10. Free E-Waste Disposal location for TVs, computers, peripherals, & printers. The Transfer Station is closed for Christmas, New Years, Easter and Town Meeting.